Time: 6:30 a.m. Sunday. I shouldn’t be up this early, having been up late working at a concert by my employer, the Reno Chamber Orchestra, but here I am. How could I disappoint you kind readers by not writing this and sleeping in instead? Place: At my main computer, admiring the morning light playing on the layer of dust covering every single thing in my vicinity. Reading: As mentioned above, this is a Reno Chamber Orchestra concert week, which means that just about everything else has been set aside temporarily. I am still reading Donna Tartt’s The Secret History, Martha Beck’s Finding Your Own North Star: Claiming the Life You Were Meant to Live, and even returned briefly to reading a book I have sadly abandoned for a while, the exhibition catalog Out of Character: Decoding Chinese Calligraphy. Viewing: This was even more strongly impacted by the Orchestra week – no films, other than the last several minutes of Red River on Turner Classic Movies while stuffing Reno Chamber Orchestra programs, no television other than a little news in the morning, and no art of any kind. Listening: A mixed bag. I listened to about half of the recent two-CD release of John Tavener’s beautiful The Veil of the Temple, one of my recent Amoeba Records San Francisco purchases. When I say I listened to half of the CD set, that means that I listened to about an hour of music, which represents perhaps 15% of the composition’s full length, listed at seven hours at Tavener’s website and at eight hours in most references (the work was much abridged, obviously, for the CD). I was also in the mood for some downbeat relationship music, and Sarah McLachlan is, for me, the go-to person in this area. I say that in a very affectionate way, because I love her and her music. After listening to both Fumbling Towards Ecstasy, still for me her best and one of my desert island CDs, and her more recent Laws of Illusion, my reaction was, weirdly, less musical than technical. As compared with Fumbling‘s very natural soundscape, Laws of Illusion was produced and mixed with a very in-your-face acoustic. Everything seems compressed within an inch of its life, with Sarah’s voice roughly the same volume whether she’s singing full-throatedly or at a whisper. Presumably this was done to make the eventual mp3 sound better, but I long for the days of recordings with plenty of air around the voices and instruments. Sarah has a new album coming out soon, and will be performing at Lake Tahoe in June. I’m reasonably sure I’ll buy both the CD and one of the (rather high-priced) concert tickets! 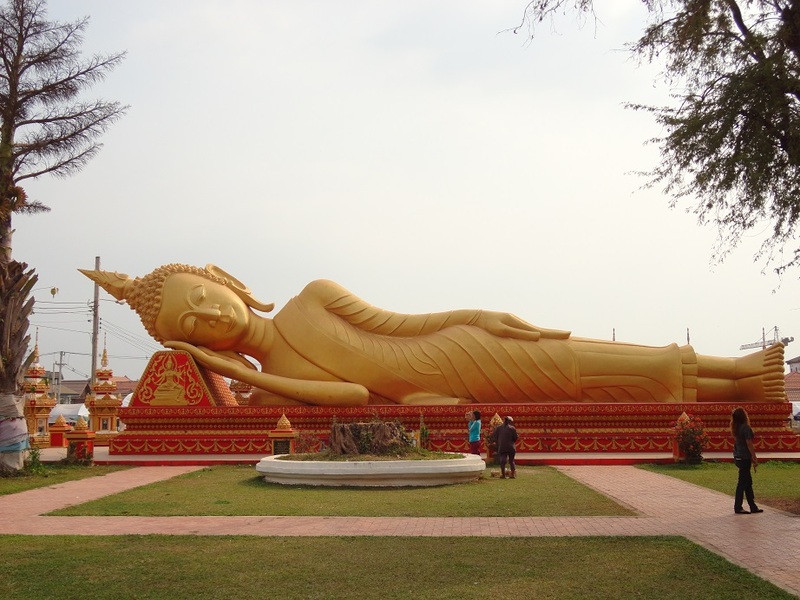 Blogging: Two more installments of my southeast Asia travel journal appeared this week. The entry from Day 7 wasn’t too eventful, I have to admit, but Days 8 and 9 featured some fairly interesting visits and nice photos. 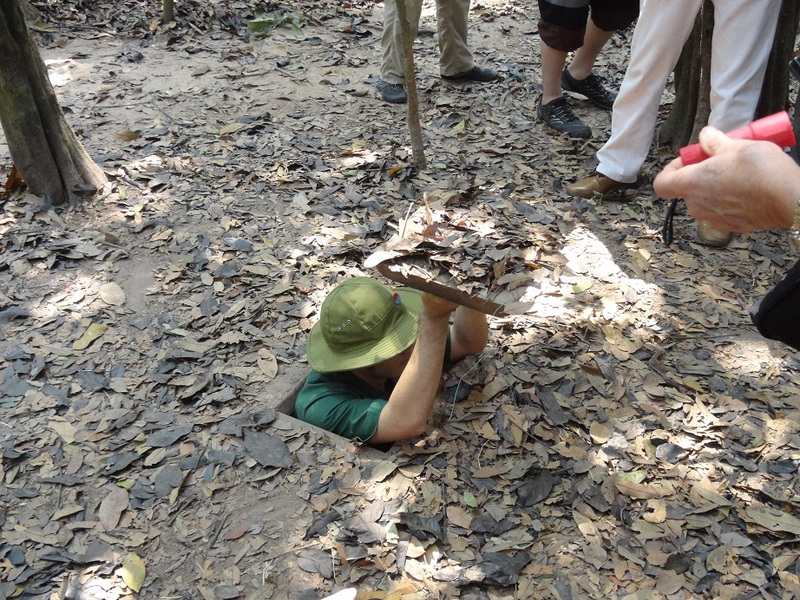 At the end of Day 9 I have just arrived in Vietnam. Just shy of half way through the trip, my wanderings in Vietnam and Cambodia are yet to come. I should have a couple more installments of the journal appearing this week. Pondering: What it feels like to be a chunk of flotsam being tossed about on the sea of the emotions and experiences and expectations of others. From a Zen perspective, simply riding the waves is the best path. But, as I also wrote last week, I do unfortunately still long to be able to exercise a little meaningful control over the events of my life. Right now, pondering, thinking, is too hard and depressing. I think I’ll stick to action for the moment, and leave the thinking to those better suited to it. Anticipating: Getting through this next difficult week, and maybe then finding a few days to run away to somewhere pleasant. Gratuitous Sarah McLachlan Video of the Week: “Wait,” one of my favorites from from Fumbling Towards Ecstasy. 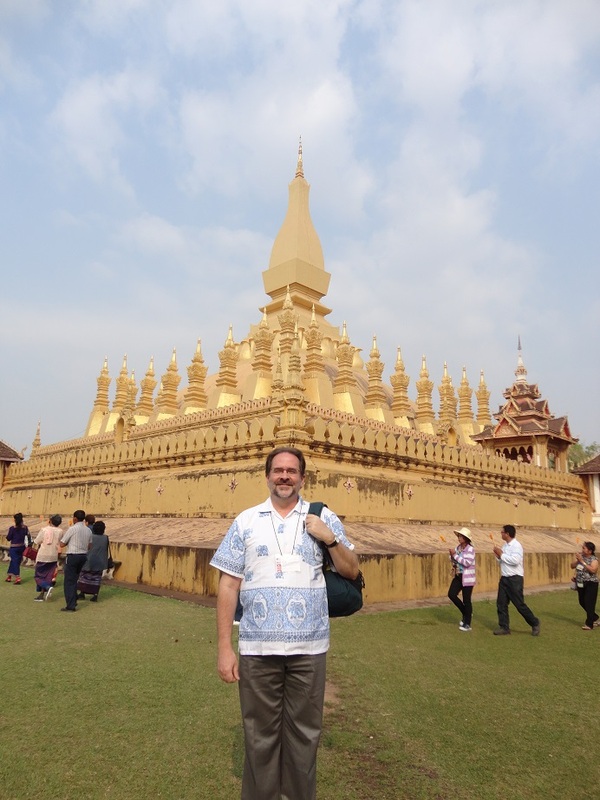 Yesterday in Vientiane was largely a day of temples. They all seem active, with a community of monks living within. All the buildings are brightly colored, with lots of yellow, gold, red, and occasionally some purple and green. The larger buildings have multiple gables, with snake-like extensions at the corners, somewhere between a decoration and a gargoyle. Even the least interesting of them is beautiful, even though a little monotony could settle in as one looks at many of them (not with me, of course, but I could imagine it). Our excursion began at Phra That Luang, the Great Temple Stupa, a huge golden complex in front of which we got a nice group photo taken. Built in the sixteenth century, Phra That Luang is one of the symbols of the country, showing up on t-shirts and other paraphernalia. By the way, I continue to try to make a habit of using the country name heard here, Lao, rather than the westernized Laos which one almost never hears. 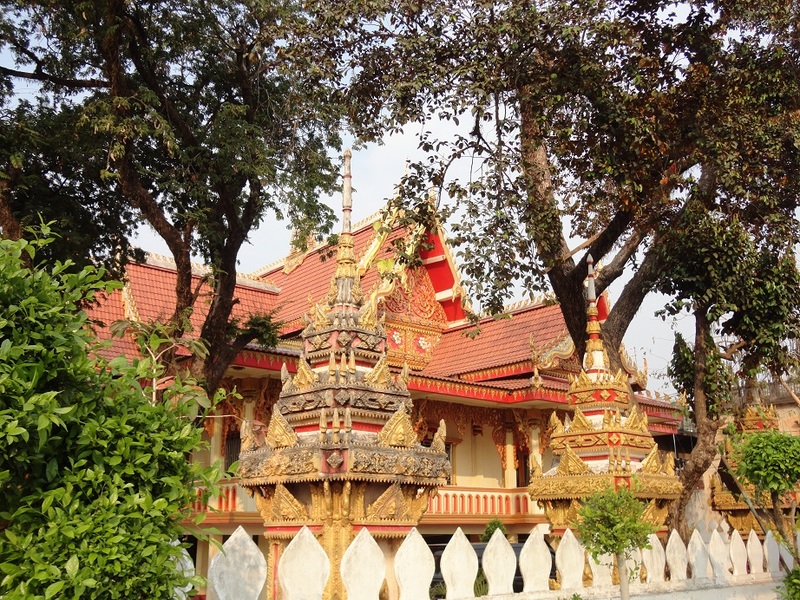 The day began in Luang Prabang with a tuk-tuk ride to the Royal Palace Museum, which had been built as the actual royal palace early in the twentieth century but which now serves as a museum. Particularly impressive was a room painted with a mural, covering all four walls, depicting life in Laotian villages when the building went up (not so different from life in those villages today, really). Another room was covered with impressive glass inlay, like the temple at Wat Xiang Thong. There were also a variety of relics, like the royal throne, musical instruments, and gifts from numerous heads of state. No photography was allowed inside the museum. 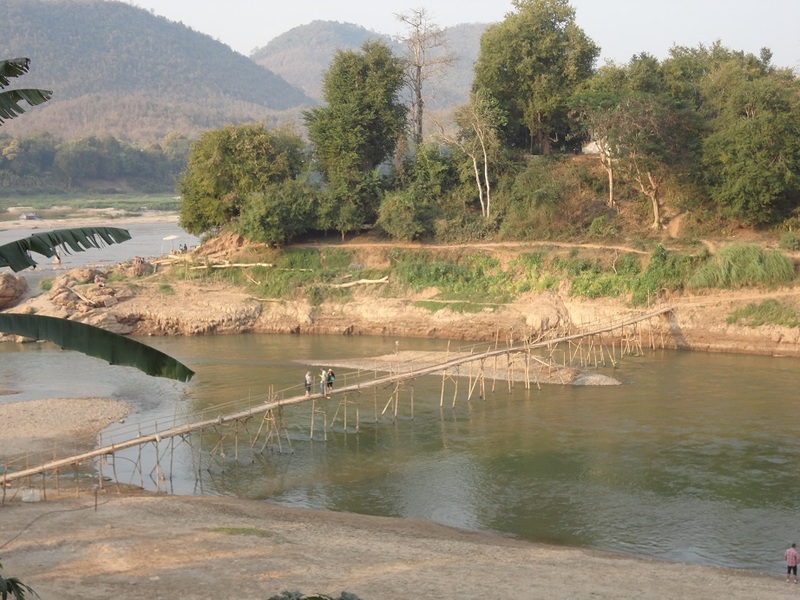 In the brief time before going to the airport, A and I walked over one of the bamboo bridges spanning the Khan River and took a brief look at the portion of Luang Prabang on the other side. It was much less touristy and more residential, but still calm and lovely like the rest of the city. Maybe that’s the quarter I’ll live in when I move here! A is very nice and curious like me, and our wander was pleasant. Then it was to the airport for the short flight to Vientiane, the capital city of Lao. 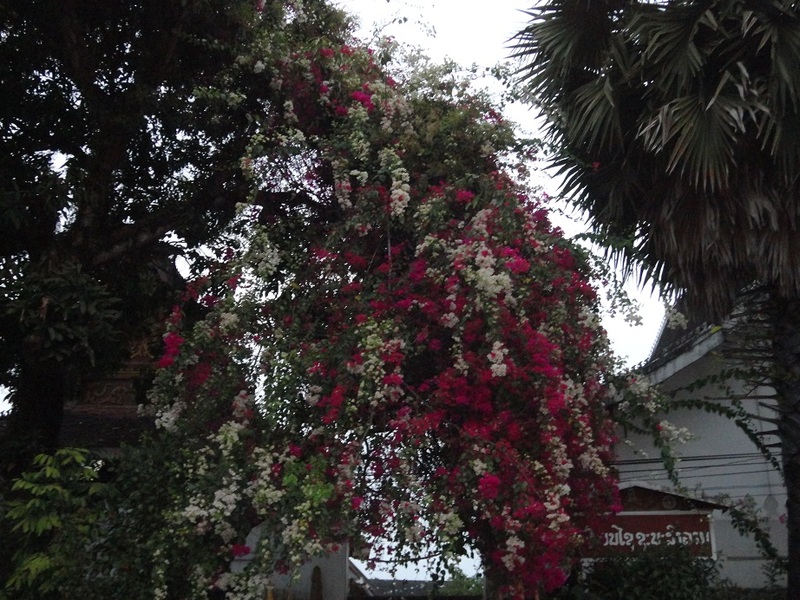 The first impression is that it’s much, much larger than Luang Prabang – it has street lights, for instance! At least in our part of town, there are large, lovely temples every couple of blocks. If there’s time tomorrow, I’ll investigate further. The hotel room is fine, although a bit efficient and not as nice as the first two in Bangkok and Luang Prabang. But it will certainly do, and it has fast, functional wi-fi! One last little digression … It has occurred to me the last couple of days that I may be considering a “conversion,” or at least an embrace, of some form of Buddhism. In fact, I may have already to some extent. I would need to investigate further to find out what form suits me best. But the basic tenets of Buddhism, the fundamental dharma if you will, is something that I already live by, if not always consciously. Obviously Buddhist art and symbolism is of great fascination already. This thought just appeared in my head earlier today; for now I will just let it rattle around in my brain for a while. After getting settled in our hotel, we took a two-mile or so walk around our section of Vientiane to get oriented. More of a “city” than Luang Prabang, there are a host of larger motels and stores and government buildings. In the side streets, though, it was like being in Luang Prabang again: little hole-in-the-wall restaurants, massage parlors, artisans, shops, and so on, perhaps a little nicer than Luang Prabang’s, but still attractively rough. Overall Vientiane feels diffuse, as though it were a dozen small towns in the general neighborhood of one another that decided to join forces and call itself a single city. At one point we went to the flood break of the Mekong River. Being the dry season, the river was quite a way off, giving a powerful impression of how much it swells during the rainy season. As we were walking through this part of King Anouvong Park, they were just getting set up for dance-aerobics that happen every night at the pavilion there. Time: 8:00 on a quiet Easter Sunday morning. Happy Easter! Place: At my main computer. Reading: I am continuing with Donna Tartt’s The Secret History, which unfolds at a leisurely pace but is still very interesting. I’m also at about the two-thirds mark in Martha Beck’s Finding Your Own North Star: Claiming the Life You Were Meant to Live. This book has been helpful for many people, and I am working through it a few pages at a time with the hope that it will help me identify what it is I want to be doing with my life. Viewing: The only film I watched this week was The Kid With A Bike (2011), the latest from Jean-Pierre and Luc Dardenne (they also have a new film, Two Days, One Night, with Marion Cotillard that will be receiving its premiere at the Cannes Film Festival in a few weeks). It’s a portrait of a boy enmeshed in violence and abandonment, and how he finds his way out through the kindness of a young woman. As is typical with the Dardenne Brothers, we receive only the barest hints of the “back story” of the characters, simply witnessing how they react to current circumstances. The ending is, also typical with them, quite abrupt, suggesting future possibilities but leaving the viewer with much room to speculate. My favorite of their films, perpetually in my top 20 of all time, is Rosetta (1999), an even more searing portrait of an angry, inscrutable young person charging her way through her difficult life. I also love The Son (2002) and The Promise (1996). But all of the Dardenne Brothers’ films have great impact, including The Kid With A Bike, and I’ll avidly seek out anything they do. Listening: I’m still working my way through Longing for the Past: The 78 rpm Era in Southeast Asia, and marveling at how these rare recordings, many of them made in the 1920s and 1930s, still exist. They sound just fine, especially with the careful remastering they’ve received here, and there are happily people who have dedicated themselves to finding and researching this music, and sharing this obscure but wonderful stuff with us. It seems that these recordings came into being simply because of the enthusiasm and hard work of a handful of sound engineers who physically took their equipment to out-of-the-way places to record music that had never been so documented before. I for one am very grateful. 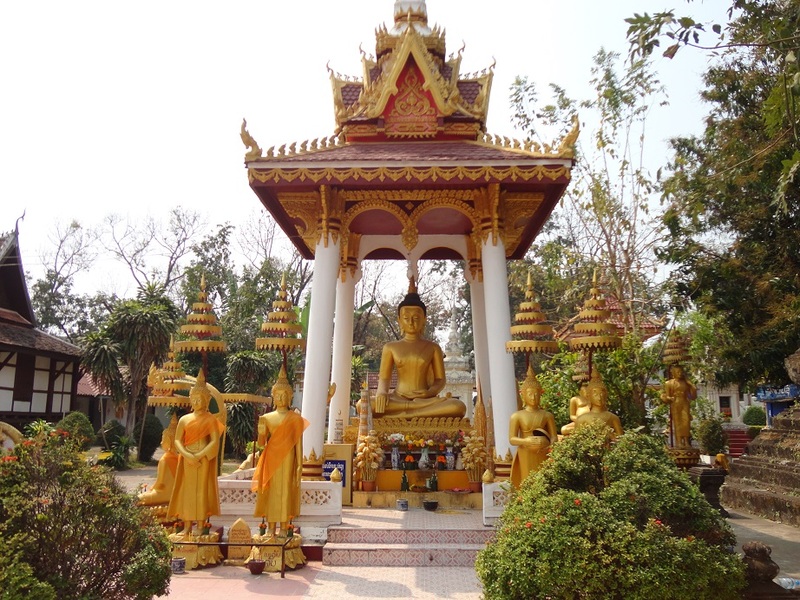 Blogging: The travel journal from February’s visit to southeast Asia continues. Two installments appeared this week (Days 4/5 and Day 6), and two more should be coming in the next few days. As I have observed before, I don’t feel that I have anything particularly unique to say about the sites and experiences of that trip. It is the sites and experiences themselves that may be of interest. Pondering: As I wrote above, the question of how I want my future life to unfold is much in my mind. Big changes are in store for some people that I know, and possibly even for myself. It would be a nice change of pace, however, to have a clear understanding of what’s happening around me and why, and what impact I might have, or even should have, in shaping the course of those events myself. Anticipating: A pleasant Easter brunch is in the offing. Unfortunately, so is thirteen straight work days starting tomorrow, including the final concerts of the Reno Chamber Orchestra’s 2013-14 season (which should be good, with music by Janáček, Nielsen and Haydn) and the Orchestra’s biggest fundraiser of the year, Derby Day. In two weeks, could someone please have a nice, tall, cool alcoholic beverage ready for me – I’m going to need it! Gratuitous Video of the Week: A trailer for Longing for the Past: The 78 rpm Era in Southeast Asia, that give some idea of the fabulous riches contained therein. 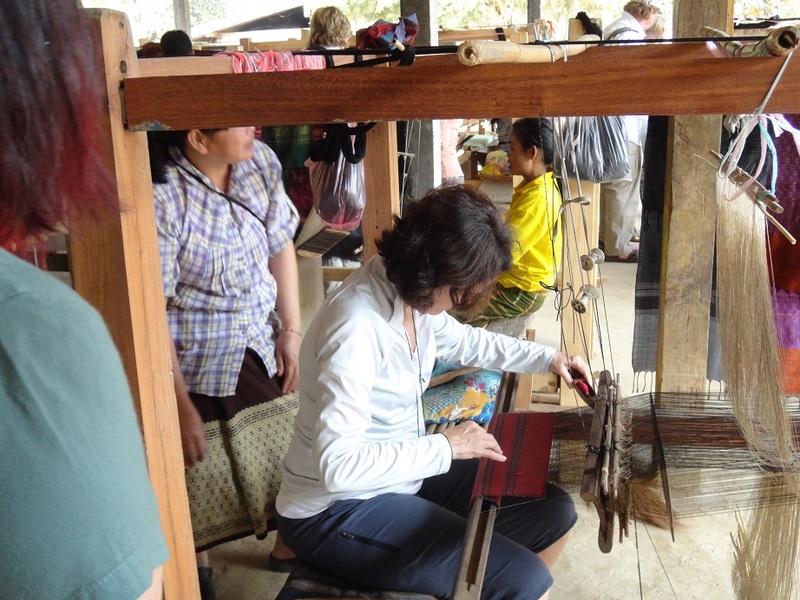 Today is what the tour operators call “A Day in the Life” of Baan Tin Keo, or Tin Keo Village, around 45 minutes outside Luang Prabang. 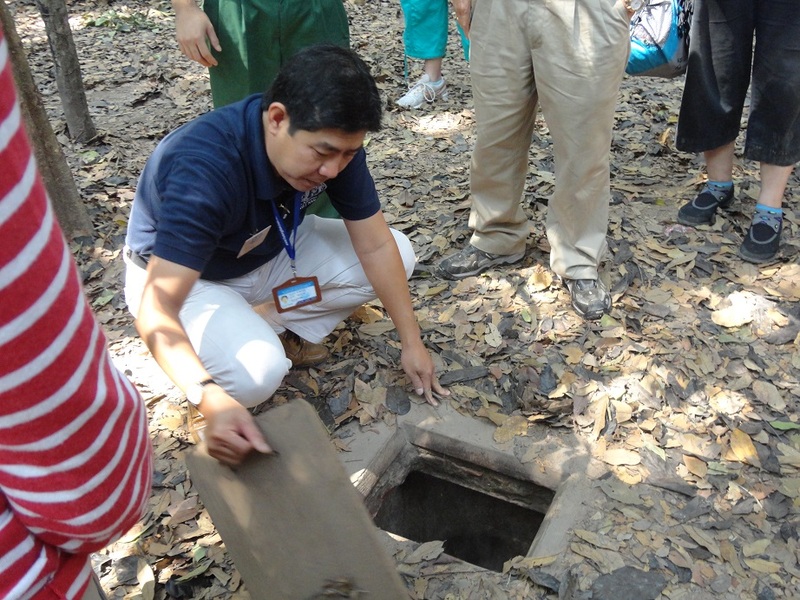 This series of activities within the village gives a flavor of village life, and shows off some of the good work being done there by the Grand Circle Foundation. First, though, the day began very early with alms giving, in which we make an offering of sticky rice to the monks of the city, who rely on these donations for both of their daily meals (breakfast and lunch). We each donned a scarf which we draped over our left shoulder and tied on our right side. This way of tying with the scarf over the left shoulder indicates commoner status – symbolizing that in Buddhism, all are equal regardless of birth status or social or financial prestige. As the monks filed by, we dropped a small golf ball-sized morsel of sticky rice in their baskets. 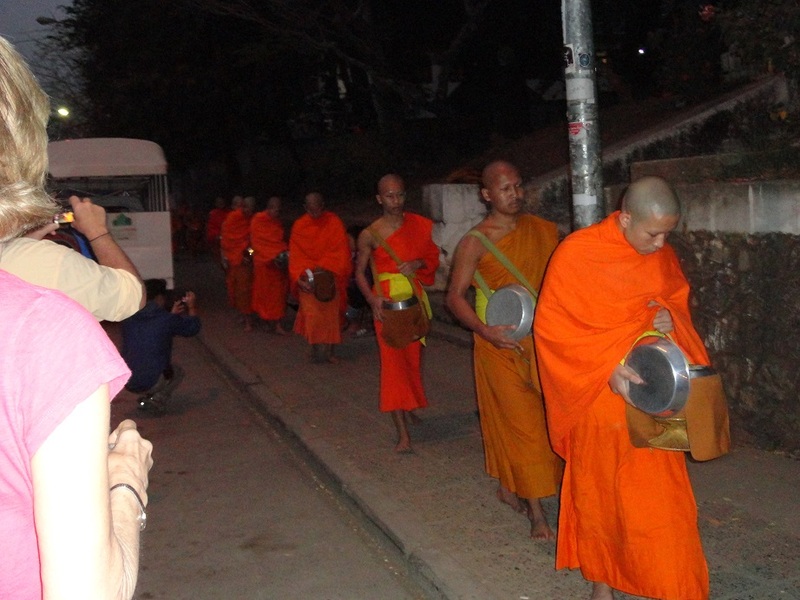 They pass by looking quite somber, not interacting with the alms givers at all. This donation of food isn’t common in the Buddhist world anymore, and is only found in Laos and a couple of other countries.